For Women’s History Month 2019, The New Jersey National Guard hosted Soraida Martinez as the keynote speaker for their “Visionary Women: Champions of Peace & Nonviolence” observance. Twenty Verdadism paintings with social commentaries were put on exhibition for the men and women of the New Jersey National Guard. Brigadier General Jemal J. Beale presented Martinez with a Certificate of Appreciation for addressing social justice through her art since 1992. 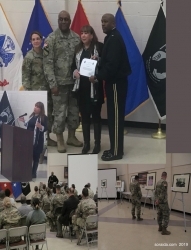 Fort Dix, NJ, April 05, 2019 --(PR.com)-- For Women’s History Month 2019, The New Jersey National Guard hosted Soraida Martinez as the keynote speaker for their “Visionary Women: Champions of Peace & Nonviolence” observance. Martinez also held an exhibition of 20 Verdadism paintings and commentaries for the men and women of the New Jersey National Guard to see and discuss. Brigadier General Jemal J. Beale presented Martinez with a Certificate of Appreciation for her visionary artwork, which has been promoting social justice since 1992. Known for advocating the rights of women, Martinez created the art of Verdadism in 1992 to promote a deeper understanding of the human soul and tolerance. According to Martinez, “Verdadism means to empower yourself with your own truth and make social change.” Every Verdadism painting that Martinez creates is juxtaposed with a written social commentary from her personal life experiences. A precursor to the "me too" movement, many of Martinez’s paintings (like “Woman on a String”) address the issues experienced by women. According to Martinez, “In 1992 I felt a need to raise awareness of these issues before they got worst.” Here is Martinez's Verdadism 1992 social commentary on Woman on a String. Martinez combined the Spanish word for truth, Verdad, with the English suffix for theory, ism, to create the word, "Verdadism." For more information, go to soraida.com. To contact the artist, send email to Verdadism@aol.com or call 856-346-3131.